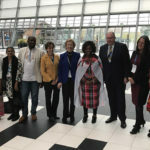 Makgale Pokwana attended the Development and Climate Days during COP 23 held in Bonn. Makgale shares his experiences and take home messages. The Adaptation Fund commemorated its 10th year anniversary at the recent United Nations Framework Convention on Climate Change (UNFCCC) COP 23 in Bonn, Germany. The Fund took this platform as an opportunity to reflect on its adaptation interventions by showcasing project stories and its major achievements over the past 10 years. The Agricultural Support Initiative works with climate change adaptation processes with smallholder communities in the lower Olifants River basin. The programme aims to reduce vulnerability and to institutionalize systemic, collaborative planning and action for resilience of ecosystems and associated livelihoods in the six villages that the project is implemented.